Barstow in July isn't so much a destination as a place to pass through on the way to cooler climes. In this case, I was on my way to Telluride to spend a week with two old friends I've known for 30yrs now. I decided to drive and take a week to get there, giving me a chance to do some peakbagging in states I don't ordinarily visit. I would have to plan carefully if I was going to be living out of my van during this trip, as most of the places between CA and Telluride are unbearably hot in the summer. The first day would be the longest drive, some 9hrs to reach the Spring Mountains outside Las Vegas. This would allow me to camp at 7,500ft, what I figured would be the minimum altitude to allow cool nighttime temperatures. I stopped in Barstow after 5hrs to give myself a chance to stretch my legs on a couple of easy peaks before continuing the drive. It so happened that monsoonal conditions were prevailing over the desert and I got to hike in a rain jacket for portions of it. This small summit near downtown along the old US66 route is named for the "B" implanted on the south side of the hill. I used the parking lot of the local Toyota dealership at the base of the south side to make the 5min hike to the summit. 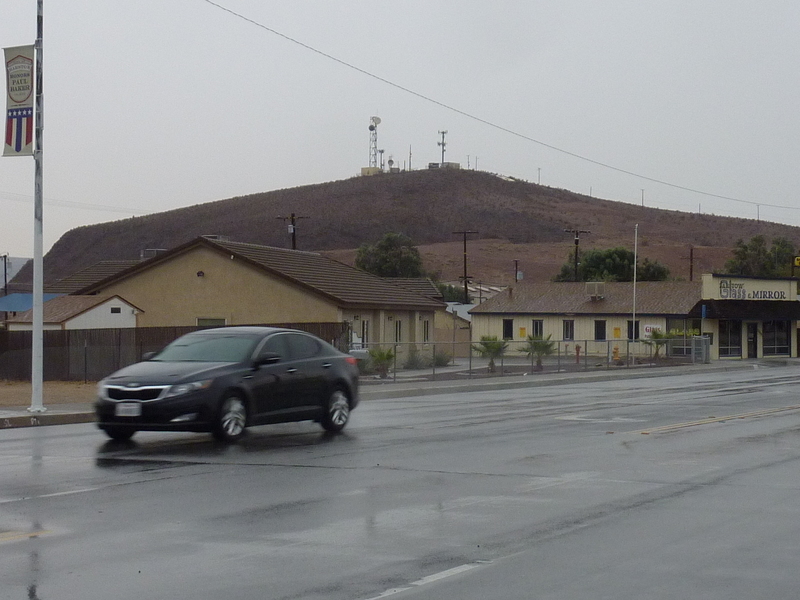 There are some telecom installations, a benchmark and views of Barstow - yeah! I wouldn't have even bothered with this one except I noted that both Terry Flood and Laura Newman had logged ascents on LoJ. I'm not one to be left out of a California summit if I can help it. What's with all the creepy bugs on the summit? Yikes!